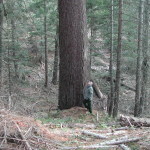 The Tub Springs Sugar Pine is the first Sugar pine to be elected to the Oregon Heritage Tree list. The species was “Discovered” by David Douglas in early 1800’s (Douglas-fir namesake); but known by indigenous people for millennia before him. 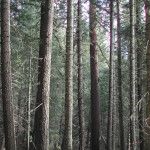 The Sugar pine’s range is from Baja California in the south to Southern Washington Cascades in the north and Western Nevada in the east to Western California Coast Range and Oregon Siskiyou Mountains in the West, and at elevations from 1,000 to about 5,500 feet above sea level. Susceptibility to white pine blister rust, and has resulted in relative decline of occurrence in most of its range. It is a source of fine interior trim and window sash lumber and furniture stock, and was also used by early settlers for structural lumber, shake and shingle roofing and siding. It was and still is a source for several food and topical and internal medicines for humans, and is an important food source for certain wildlife. 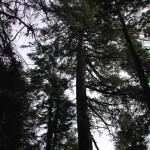 The Sugar pine is more resistant to frequent low-intensity fires than other species, and may produce and exude chemicals that can prevent other plant seeds from germinating near it.